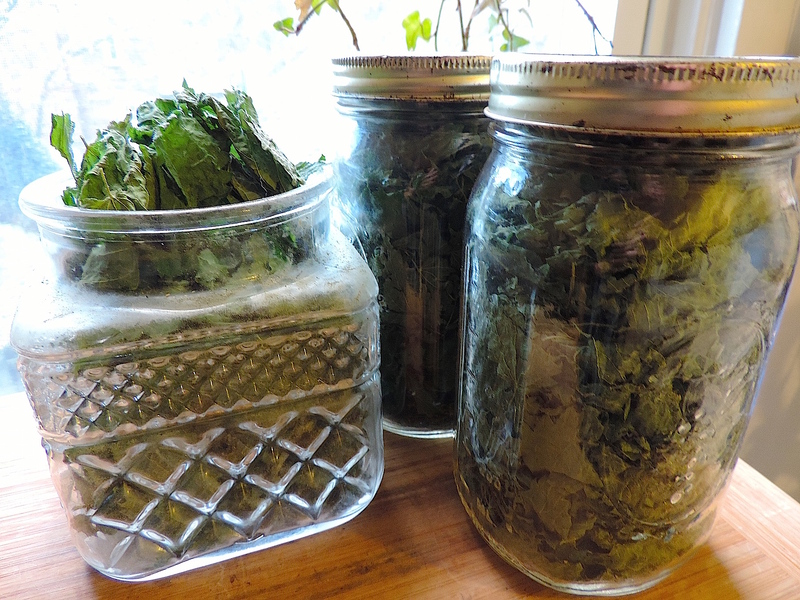 Three jars of stinging nettles, dried and ready to infuse. Each cup of “tea” is as nourishing as a bowl of soup. Don’t believe me? Try it! This plant isn’t your ordinary green — it has been extensively researched and shown to treat, among other conditions, benign prostatic hyperplasia (using the root; you can harvest that now, too), type 2 diabetes, and allergies. In other words — got BPH? Look into nettles. Type 2 diabetes? Look into nettles. Allergies? Look into nettles. Yeah, I said it. No, I’m no herbalist or doctor, though sometimes we need permission to do our own research and use our best judgement. Looking for real health? You probably already know what to do. Go for it… you’re worth it! Categories: Foraging, Medicine, Nutrition | Permalink.